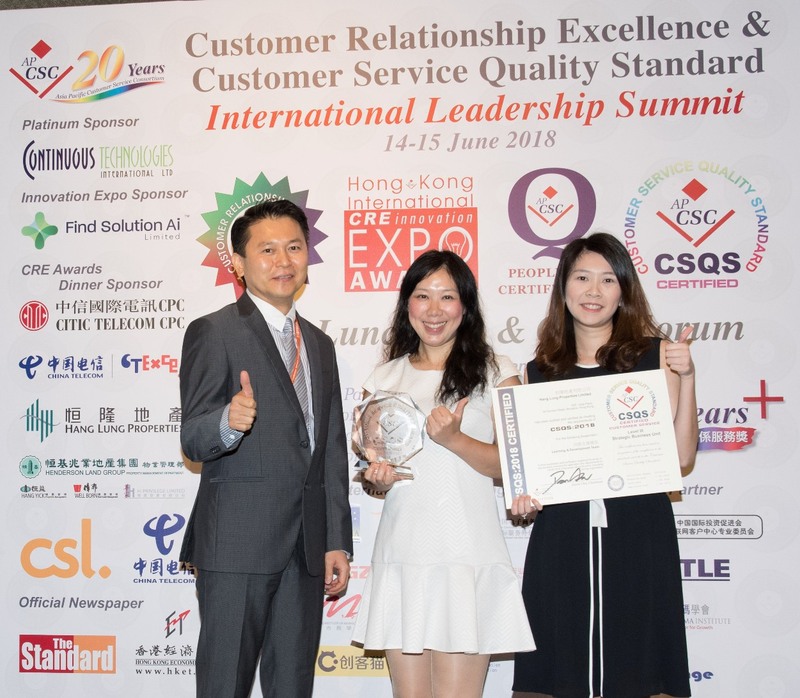 "Henderson Land Group Property Management Department (Hang Yick and Well Born) with CSQS Certification Distinction, has been achieved various kinds of Awards presented by the Asia Pacific Customer Service Consortium over the past years. This is a solid recognition and affirmation for our professional services. In the future, our professional team will uphold our commitment – customer-oriented and continue to strive for excellence to offer quality and premium property management services for our customer." "Hang Lung Properties is honored to receive the CSQS Level 3 Certification presented by APCSC this year. This reaffirms the commitment and continuous efforts we have made to provide excellent customer service. Academy 66, the Learning & Development Department of Hang Lung was first established in 2012 based on the International Customer Service Quality Standard (CSQS) Model. By implementing CSQS model, we are able to systemize and optimize our training function, promote corporate culture and values, and remain competitive in the labour market. Living up to the business philosophy of We Do It Right, Hang Lung sees every staff member as our valuable assets and we have dedicated significant resources for staff training and development program. This is not only beneficial to the individual career development of the staff but is also essential for the sustainable development of the Company." "The CSQS has a significant advantage over other standards in the fact that it focuses on the core value of customer relationship excellence. The CSQS ties together years of research, benchmarking measurement, best practices and business case studies, enabling the CSQS to create customer life-time value and address bottom-line issues that affect the overall business performance of the organization." "The CSQS is a robust and solid platform, enabling organizations to enhance and improve their customer service processes. The standard has been in development for many years and we are pleased to introduce the CSQS to businesses here in Singapore. I am confident that businesses in Singapore can learn a great deal from the standard, since many market leaders in Hong Kong and Taiwan are already adopting it and leveraging on the benefits." "Through promoting and implementing the four areas of CSQS: management responsibility, resource management, process management, performance management, with plan-do-check-action cycle, the customer service industry could improve the overall service quality and performance. The CSQS could also help the outsourcing sector to achieve clienteles’ business outsourcing service level agreement, strengthen their competitiveness, and enhance their profitability!" 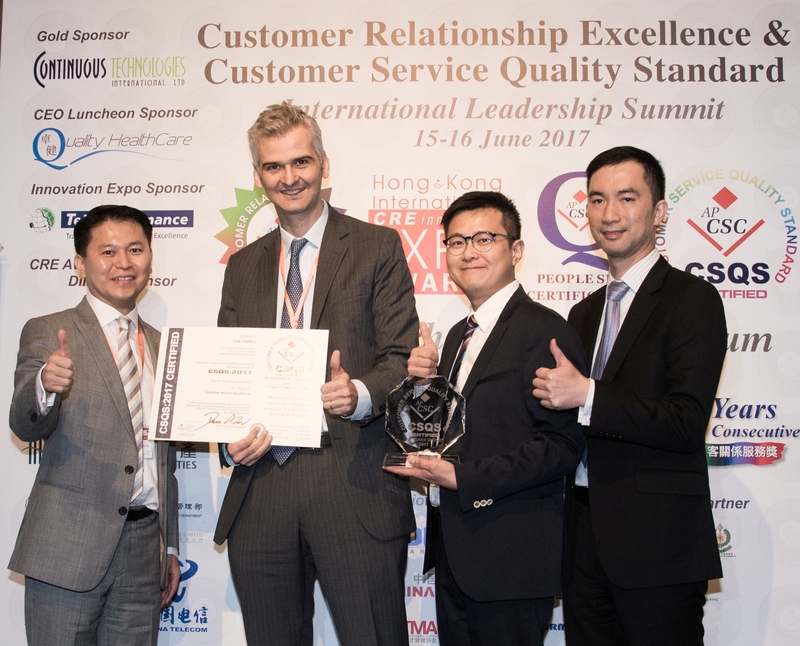 "We are very honoured to receive the Best-in-Class ’CustomerService Level Management’ Award from the Asia Pacific Customer Service Consortium. In recent years, SUNDAY has launched a number of initiatives designed to improve quality across all facets of its business. This award recognizes the effort we have made to improve overall customers' experience with SUNDAY. As we rollout full-fledged multimedia services, SUNDAY's customers should experience improving Customer Service quality excellence and a suite of comprehensive Customer Care solutions." "The contribution of the introduction of CSQS to telecom service provider is three fold. Firstly, this validates and recognizes the ongoing passion and effort in searching the excellent customer service standards within the daily call center operation. Secondly, it represents a pioneer effort to practically recognize the impact and usefulness of CSQS standard in supporting the call center auditing and continuous improvement. Finally, the implementation of various analysis methods enables telecom service provider to perform even better of the customer service management in the competitive environment in both Hong Kong and China." "People say service is an art because it is hard to define and measure, not to mention how damaging it can be when service level fluctuates. But with APCSC and its best-illustrated examples, art is turned into science with CSQS and more importantly, with its advocacy of knowledge management. Knowledge management have continuous impact on business and the enterprise and it will certainly further propel knowledge-based leadership to new heights. APCSC is also an international organization with strict educational standards and a big heart: it not only embraces all market leaders from various industries but also spares no effort in helping those that are striving to upgrade their service level from good to excellent, ultimately to turn their customer service center into a strategic business unit." “Pacific Satellite has always leaded the market in terms of developing and deploying new technologies in satellite communication, broadband technologies or digital TV set-top boxes. In the past, our service approach focus on technical problem solving and system proper function for our customers, and less aware of the total customer service requirements. We did not integrate the customer service function as an intrinsic part of our total business strategy. "One of the core business values of CASCADE is to continuously pursue excellence in customer service. CASCADE's customer service operations is at world class standards, and we are always striving to be even better. With our high level of service quality, our customers don't have to worry about their IT and telecommunications infrastructure and can focus on the betterment of their own business. CSQS is the most comprehensive certification focusing on customer service quality on a world class level. I am honored that CASCADE has received the 'Customer Service Quality Standard Top Achievement', which further reinforces our commitment in customer service excellence." "Through the CCCA program, I have picked up the concept of world class call center standards and learnt how to streamline the business process in my call center. We applied the Best Practice by following the guidelines of CSQS. The implementation of these standards can definitely help us in building customer relations as well as future business development." "Certified Call Center Supervisor (CCCS) and Certified Call Center Analyst and Auditor (CCCA) courses helped me define our call center requirements and assisted in our vendor selection process. I was able to articulate our expectations, define targets we hope to meet and map processes which are required when supervising and monitoring call center performance. The auditing techniques which were presented in the course allow me to provide follow up to call activities and assist in planning our field needs as well as call center resources and requirements. We can be much more pro-active by analyzing the data being collected by our call centers, which will also assist us to improve customer satisfaction and service quality. I found the courses to be highly effective and valuable. Course material was well prepared and organized. In addition, the facilitators overseeing the exercises and activities were excellent. I found the material to be very informative and it has provided a knowledge which I can apply in the future as well as today. I would highly recommend using HKCSC’s programs and courses. " "The CCCA program provides a detailed walk through of the Customer Service Quality Standard which gives me an opportunity to understand and plan ahead the quality improvement projects for our contact center. It definitely helps me to improve the service performance of our CS professionals." 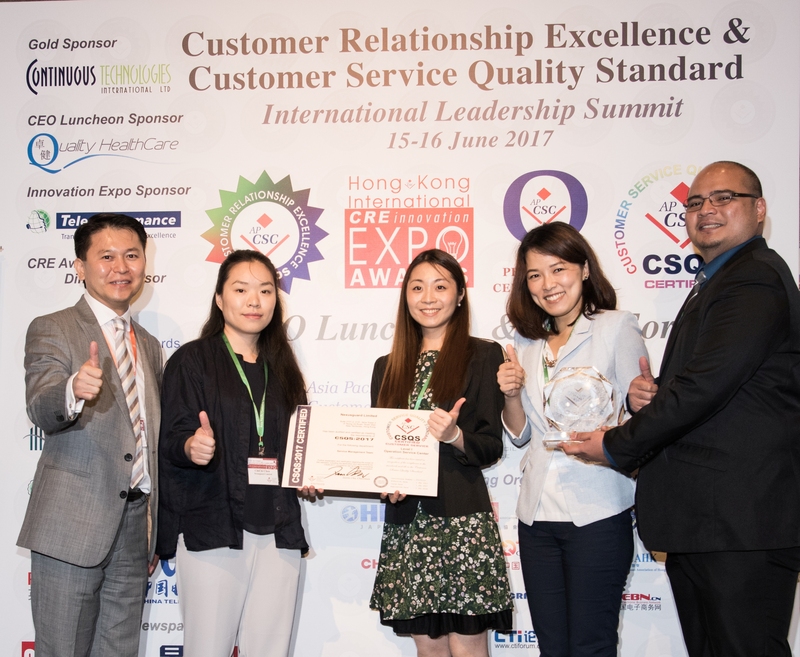 "Since Chunghwa Telecom participated and was honored with four categories of awards, including “Contact Center of the Year” in the “Customer Relationship Excellence Awards” organized by the Asia Pacific Customer Service Consortium last year, it has been further awarded with the two honors of “Customer Satisfaction Quality System of the Year” and “Best Use of Knowledge Management of the Year” in 2010, which demonstrates our company’s constant endeavors and determination towards enhancing service quality and offering stable quality services. Chunghwa Telecom has always strived towards the managing principles of “Dedication in the Telecom Industry, Emphasizing Professionalism, Enhancing Efficiency and Inspiring Service”. As for customer service, it has emphasized the commitments of “3Q: Quality, Quickly and Emotional Quotient”, so as to advance towards the goal of becoming a world-class contact center with best-in-class customer service. I would like to hereby thank the Asia Pacific Customer Service Consortium for its contribution towards the long-term promotion of the value of CSQS (Customer Service Quality Standard), and hope that we will be able to continue to enhance our customer service quality through this learning and sharing platform, so as to develop more outstanding customer relationships, and advance towards the vision of becoming the “most valuable and most reliable information, communication and telecommunication company." "PCCW is devoted to creating industry's best customer experience with effective sales management, and there can be no greater affirmation than being recognized best in class in APCSC, the reputable customer service consortium in the Asia-Pacific region. We are honored by this recognition and pledge to work even harder to exceed our customers' expectations." "Our Customers and our employees are our most valued assets. We strive to deliver World Class Customer Service and direct our journey in search of excellence along a path of continuous improvement. While aiming to delight our customers with the warmth of caring service, our teams are committed to unfailing compliance to quality standards, and best in class customer centric service delivery processes. Our investments achievement will encourage us to continue and improve our efforts in service delivery with single minded focus on the customer. We appreciate the support and guidance re in human resource development & performance management systems empower us to deliver sustainable performance across multiple service dimensions. This ceived from APCSC throughout our CSQS journey." "We are committed to our ‘get closer’ customer proposition and customer service has always been one of the three pillars of SmarTone’s business. SmarTone is honoured to be lauded by the APCSC as having the Best-in-Class Customer Satisfaction Management. This award not only advances our market recognition for customer service excellence and consistency, but also encourages us to introduce further enhancements to extend our lead in customer service." "The provision of efficient and caring service to our growing family of customers is assigned central focus within the business and strategic plans of Dialog Telekom. 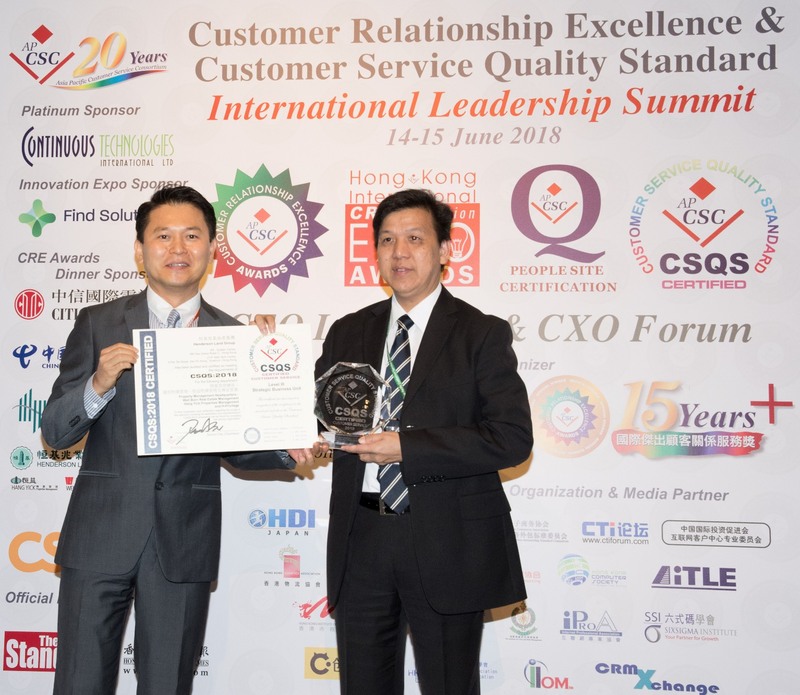 The CSQS certification programme provided the company with a structured roadmap to the achievement of service excellence and regular benchmarking of the company's journey towards world-class standards in customer service. The achievement of CSQS certification reaffirms the company's continued commitment to continuous improvement and learning in the sphere of service delivery, and more importantly evidences the commitment and dedication of our service team to the delivery of best in class service to our customers." "It is a great honor for NOKIA to receive the Best-in-Class recognitions of ‘Service Level Management’ for our China team in Guangzhou Contact Center, and ‘Multi Lingual Service Management’ for our Singapore Team in Kuala Lumpur Contact Center. Our global Contact Center network handles tens of millions consumer contacts yearly and they are in central role in driving our customer satisfaction. We have pride ourselves in developing our contact center network in the most efficient and effective way, and these awards are testimonial to our efforts. Our aim is that our customers feel always connected, satisfied, safe and confident throughout the whole lifecycle of their mobile device usage." "Providing our customers with a best in class service experience is a paradigm central to the business ethos of the Dialog Telekom Group. Securing CSQS Level 3 certification and Best in Class recognition in Proactive Service Management for the second consecutive year, and additionally being awarded Best in Class recognition for Multi-channel Contact Management bears testimony of the commitment of our service team towards the achievement of this ideal."